Caitlin Hendrix is back as a rookie FBI agent in the FBI's Behavioral Analysis Unit. She is assigned to a case in Solace, Texas, near Austin, where women are disappearing on Saturday nights. There are six confirmed, but there may be more. The women, all blond, are disappearing from a wide variety of places - a movie theater, out of her car at a train crossing, from a mall parking lot, even from her home - and the clues are few. When they find their first body, the scene is disturbing. The victim is laid out on the ground wearing a white nightgown, and a second body is found deeper in the woods, also dressed in a white nightgown. Both bodies are surrounded by Polaroid pictures, stuck in the ground like headstones. All the photos are of blond women wearing a white nightgown and obviously dead. It is Caitlin's job to profile the unsub (unknown subject), get into his mind, and determine how he selects his victims. The team ends up profiling a confident, charming, meticulous killer who somehow convinces his victims that he is not a threat. After they lower their guard, he takes them. At that point they are just a part of his twisted need to possess, control and destroy them. There is a tip that leads them to one suspect, who they watch closely, waiting for him to make a misstep. But he is also an expert in his own way at profiling people, identifying their weaknesses, and manipulating them. Into the Black Nowhere is another complex, intense, fast-paced novel full of nail-biting suspense with a riveting plot. 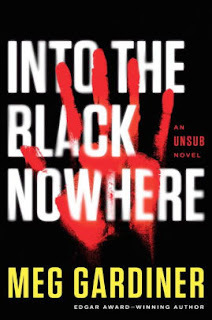 Honestly, I was hooked before even opening the novel after reading her brilliant UNSUB and knowing Into the Black Nowhere featured Caitlin and continued her story. Caitlin was already a well-developed character, flawed, but smart, insightful, and strong. The character development continues here along with Caitlin's profiling skills - interpreting clues, and insight into the suspect's actions. I can hardly wait for Caitlin's next case. I loved the complexity of the plot and the twists it took. Sure it was based on the actions of Ted Bundy, but Gardiner takes this and does an excellent job using it to create a thriller to remember. Caitlin continues to be intelligent and clever. By sheer determination she will get the suspect. She's a great character and this is an exceptional series. It is no wonder a TV drama based on this series is in the works at CBS. Yet again, this is definitely a stuck-over-night-at-the-airport book that will keep you awake and hold your complete attention - only you'll want to be in a well lite area, maybe near security. Disclosure: My review copy was courtesy of Penguin Publishing Group via Netgalley.